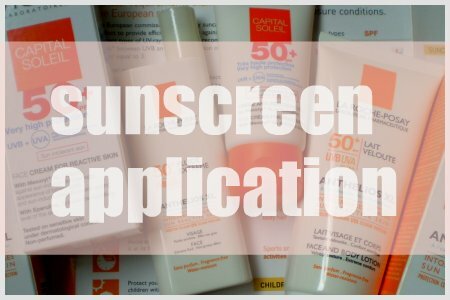 One of the skincare products that I take a lot of interest in isÂ the sunscreen.Â I’m always interested to find out more andÂ here are ten tips I’ve put together based on what I’ve found to be interesting information regarding sunscreen formulations and their application. 1.Â Are chemicalÂ sunscreens better than physical sunscreens? Chemical sunscreensÂ use organic absorber to absorb UV rays and invalid the damage of UV achieving a full blockage of a broad spectrum UV rays, withÂ someÂ even reported toÂ retain their efficacy on human skin forÂ up to 8 hours.Â However, you need to take note that components in chemical sunscreens, which include oxybenzone, avobenzone (Parsol 1789) may be detrimental in certain instancesÂ and the fact thatÂ avobenzone degrades about thirty minutes after application.Â Â If you want good chemical sunscreens,Â choose those European brands with Mexoryl and TinosorbÂ as they offer superior protection according to this study. 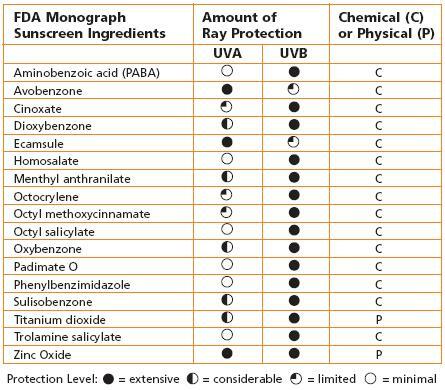 I’m adding this chart that I obtained from the Environmental Protection Agency for reference which tells you at a glance the different chemical and physical sunscreen ingredients as well as the type and amount of ray protection that they provide and their class. Whichever type you pick, always ensure thatÂ your sunscreen is broad spectrum and offers protection against both UVA and UVB rays. UVB rays are the primary cause of skin cancer while UVA rays cause wrinkling, skin sunspots and are also now implicated in skin cancer. 2. Is a sunscreen with higher SPFÂ better? However, there is anÂ advantage of pickingÂ a higher SPF sunscreenÂ because most people are likely getting a significantly lower SPF level because they’re usuallyÂ not applying enough (see next tip for application amount).Â ButÂ please noteÂ that a 15 SPF facial moisturizer plus a 15 SPF facial sunscreen does not equal 30 SPF.Â It’s still just 15 SPF. 3.Â How much sunscreen should I apply on my face and my body? 1/4 to 1/3Â of aÂ tsp of sunscreenÂ is apparentlyÂ adequate for our face, as I have examined here. For the rest of our body, I understand it is 1/2 tsp to each arm, 1/2 tsp each to the front and back of our torso, and 1 tsp to each leg. 4.Â DoÂ I need to apply moisturizer beforeÂ my sunscreen? Check yourÂ sunscreen formulation.Â Â Unless your skin is very dry, some of the formulations are pretty emollient and it may not be necessary to apply a moisturizer before applying your sunscreen. In addition, note that a chemical sunscreen should go on clean, bare skin first and you need to give it time to be absorbed, because in order to be effective, it must interact with skin cells.Â On the other hand, a sunscreen with a physical block like titanium dioxide or zinc oxide can be applied last, after a serum or moisturizer. 5.Â Do moisturizers orÂ mineral makeup with SPF provide adequate UV protection if used on their own? 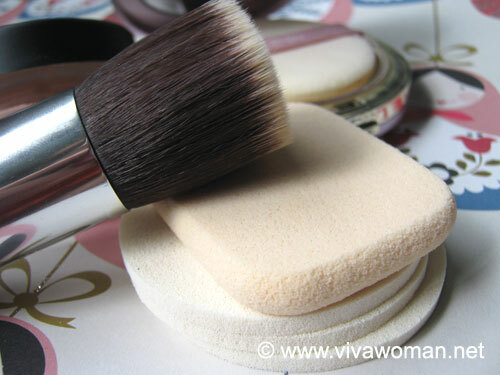 Yes, if you useÂ the required dosage ofÂ 1/4 to 1/3Â tsp on your face.Â Â But this isn’t feasible as it would mean your makeup would be too thick.Â So, it is still better to use a sunscreen.Â Also consider the compatibility of your sunscreen with your makeup and it is best not to layer non-micronized mineral makeupÂ with an avobenzone containing chemical sunscreen. Technically, it is best to wait 20 minutes after applying a chemical sunscreen beforeÂ putting on your foundation orÂ makeup because it takes that length of time for sunscreens to optimally distribute themselves within the stratum corneum (horny outer layer of the epidermis).Â However, in reality, this may not be feasible especially in the mornings when we’re rushing for time.Â So do some time management if you wish to optimize your sunscreen.Â Otherwise, use a physical sunscreen because theyÂ are effectiveÂ immediately upon application. 7.Â How frequent do we need to reapplyÂ sunscreenÂ on a normal day-to-day basis? 8. DoÂ I need sunscreenÂ even thoughÂ I stay indoors most of the time and if so, what SPF do I use? UVA rays can penetrate the windowsÂ so it’s important to wear a sunscreen even if you’re indoors andÂ wearing one with at least an SPF 15Â should give you sufficient protection. 9.Â Do I need to apply sunscreen even when it’s cloudy, raining or snowing? Yes, wear your sunscreen rain or shine and even during winter becauseÂ UV rays can penetrate clouds, mist and fog as well as get reflected on snow by up to 80%. 10.Â What’s the difference between a sunscreen that is water resistant and a sunscreen that is waterproof? According to the FDA,Â sunscreens labelled as water resistantÂ must maintain their SPFs after 40 minutes of being submerged in water while sunscreens labelled as waterproofÂ must maintain their SPFs after 80 minutes. Of course there are a lot more information you can find out about sunscreens.Â Â I have put these together based onÂ my own experience plus common concernsÂ I have gleened from the various resources such asÂ this very usefulÂ FAQ at Makeupalley.Â Â And do note that youâ€™ll still need to conduct your own risk-benefit analysis when selecting the right sunscreen for yourself, especially taking into consideration your skin type, age group, lifestyle and safety concerns.Â Most importantly, you have to pick one with a texture, finish and scent you really like because it’s going to stay as part of your dailyÂ skincare regimen. m a guy wid gud fair complextion.but i m suffering from pretty gud sunburn although m not much exposed to the sun.but the lil exposure on way to colg from hostel and return for the past 2 years have resulted in a black layer over my original skin.parts of feet which r covered by sandals r wid gud complextion and rest have undergone sunburn.tell me which brand is gud and what spf.i have oily skin. mrityunjay: It’s quite hard for me to recommend you which brand is good. Sometimes it’s a trial and error process. 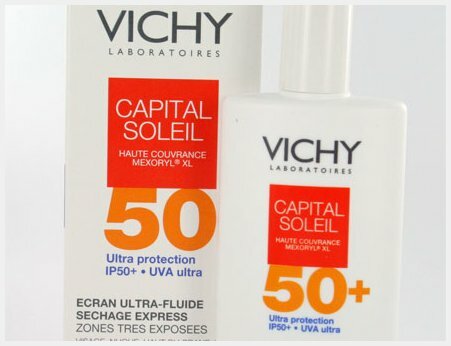 If you’re into chemical sunscreens, maybe you can try those under La Roche-Posay that contains Mexoryl. For physical sunscreens, I’ve learnt that Blue Lizard has a range of effective sunscreen but I’ve personally not tried them though. Most sunscreens have an oily base. Those that don’t tend to contain alcohol, which can be drying for you skin long term. This is the best informative article on sunscreen that I have come across so far.It is very comprehensive.Thanks. Sesame, whats your routine for applying SS? I’m currently using Neutrogena UltraSheer Dry-Touch SPF50+ (recommended by my derma). However when i wanna apply loose powder + concealer, it seems cakey & usually the morning rush doesnt allow me to wait for 20mins. I couldn’t find the full ingredient list online but it sounds like it is too dry for you. Do you apply any moisturizer or oil underneath or over? I now use an anti-aging oil before applying my sunscreen. It has been perfect for me. Before that, I applied sunscreen alone but because of the high active sunscreen ingredient, my skin sometimes felt slightly tight in the day. Neutrogena is more of a chemical sunscreen so yes, best to wait for awhile before applying makeup. However, since you’re using it to protect you mostly against casual sun exposure, it should be all right. Or, any other SS that you can recommend? How about the Shiseido ones? Heard good reviews about them. I suspect La Roche-Posay Anthelios XL SPF 50+ Fluide Extreme For Face might be quiite close to Neutrogena’s. You’re welcome. 🙂 I hope you can find a suitable sunscreen soon. If i use a day cream with sunscreen in it and also foundation with sunscreen in it do they counteract? I Heard this from a makeup person.. true or false? It depends on the ingredients but generally, I doubt so. The foundation should have lower sun protection and so it’s not the sunscreen ingredients. It could be other ingredients within the foundation but in that case, even those without SPF would be a problem. What I know is mineral foundation did pose a problem some time back but that’s like very limited. A quarter teaspoon thereabout. Yes, you can use grapeseed oil before your sunscreen. Every time I use a sunscreen on my face, even ones specially formulated for acne prone oily skin, I break out, and my face becomes an oil slick by noon! Do you recommend any facial sunscreens that won’t break the bank? Check out Badger’s range. They have some good ones that are really affordable. The Aloe Vera formulation is quite light.